Entrants must produce and submit an actual product and not just design work. We understand that not everyone wants to part with their products�so there's a separate section of the competition just for photo entries (but note that the prize for photo entries is for the images to be displayed on the�website & photo entries can’t be�awarded any other prize).�Photos should be good quality images, clearly showing different views of the product. Entries must be of a high quality with well executed techniques & a finished piece of work that looks attractive. In particular don’t forget to make the product look good from all angles and that it is fit for the purpose and user it was designed for. Entrants are�encouraged to think about the product they design and how they can��ake it�different to other entries. How�can it solve a real design problem? Can the focus be on a design problem not close to the student’s own experience e.g. linked to the United Nations�17�Global Goals for Sustainable�Development? The product can be smaller than the tin but must be able to fit in the tin with the lid closed. It can be rolled, folded or taken apart to fit in to the tin (but remember it must be a finished product and not a materials & components kit). Any product can be entered but it must be designed for a particular user and have a�purpose/function. Information on the typical user is & what the product function/purpose will be�included on the�application form). An�application form�is required with each entry (including photo entries). These forms often play an important role in the judges understanding of an entry, and it's often these forms that can be the deciding factor when choosing a winner. Every school entering the competition receives a free copy of ‘Designing for �User Needs & Design Contexts’�worth �25 (excludes photo entries). This will be�emailed�to the address on the�application�form. I have to use 2 different categories of D&T materials. What does that mean? 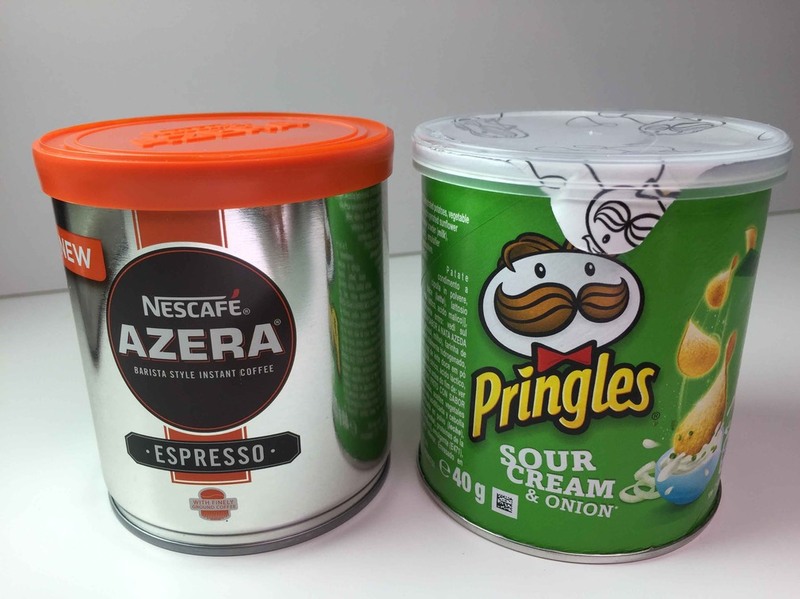 The product has to fit in to a tubular tin that is the same size as a 40g Pringles snack tin or a 60g Nescafe Azera coffee tin. 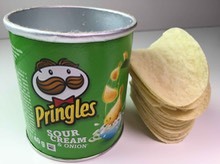 The Pringles can be�bought from smaller supermarkets, petrol stations etc. and the coffee tin from larger supermarkets. Don’t forget to clean the tin when testing to see if the product will fit! DON’T post the product in�the tin unless it is easily crushable. Non crushable�products should be carefully packaged up in an envelope as this will be�cheaper for posting. Do I have to send in my actual product? Can entries be sent from�outside�the UK? Where can I get help, ideas and�inspiration? Are you a student stuck for ideas & need some�inspiration?�Not sure how to use different materials together?�Not sure what the terms ‘user’ and ‘function/purpose’ in the brief means?�Are you a teacher looking for ideas on how to use the competition? Even bigger and better 1st prizes this year! The competition aims to�encourage students to enter the competition and therefore there are lots of prizes to be won! Prizes may be substituted or changed at any time. The winner’s�prizes are delivered to the school by us with a small prize giving ceremony. All other prizes are sent to school for distribution. Any mainland UK school or college student in year 5 -11 (age 9 -16). Note the age group has changed from previous years and entries from years 5 and 6 are now allowed. Students can submit as many entries as they wish. Is�this competition the same as last year? Can�students�from any material area enter? Yes! The competition started out as a textiles competition a few years ago but it’s now open to all D&T material areas to reflect the broader materials�approach to D&T. The judges are looking for two D&T�categories of materials being combined together�in a�product and it�doesn’t matter what these�materials are or how much of each material is used. Materials can also be used in a form that has been purchased (e.g. a metal component) or they can be�cut�and shaped by the student. Does the work have to be done in school? Entries can be sent at any time during the year. Who do I contact if I have questions about the competition? Email�julie@julieboyd.co.uk�if you have any queries about the competition. Don’t forget to read information on this page first as the answers to your�question�might be here. Think carefully about what is written�about the user, product function and materials on the�application form.�Don’t just state the obvious - explain thoughts in detail and justify decisions. These explanations help the judges understand the product and can make a big difference to who is chosen as a winner. Every school entering the competition receives a free copy of ‘Designing for �User Needs & Design Contexts’�worth �25 (excludes photo entries). This will be�emailed�to the address on the�application�form (one copy sent per school). Where do I send my finished entry to? Application forms must be attached to each entry. Both pages of the application form must be completed. Make sure the package is well wrapped.�An ordinary envelope is usually not� sufficient and many of these type of entries arrive ripped with the products�damaged. Padded�envelopes work best. Wrapping packages with lots of tape�also helps make them stronger.